Yogyakarta is a thriving, bustling, creative and exciting City, known for its highly creative handicraft manufacturing skills. The talent and expertise passed down through generations can still be seen today in ceramic production, textile dyeing, weaving and handicraft fabrication, wood and stone carving and of course in some of the finest art in Indonesia. 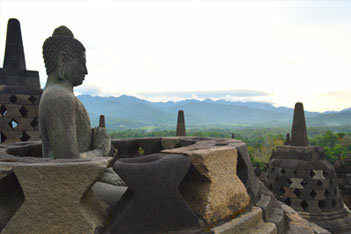 Borobudur is an important and world renowned UNESCO World Heritage monument. The Buddhist stupa and temple complex date back to the 8th century. Borobudur is not just one of the world’s truly great ancient monuments, but is also the single largest Buddhist structure anywhere on earth. Your d’Omah guide will take you in air-conditioned comfort to and from the temple which is about 1.5 hours drive from d’Omah. Prambanan is a dramatic collection of massive Hindu temples built by the Mataram Kingdom, rulers of central Java and defeaters of the Sailendra Dynasty. 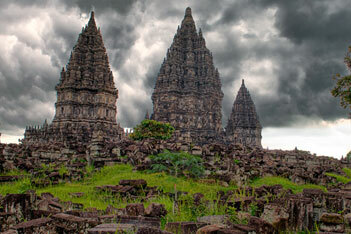 A UNESCO World Heritage Site, in almost any other country a magnificent ancient monument on the scale of Prambanan would quickly be designated a national symbol. However, that accolade is usually awarded to its nearby neighbour, Borobudur. If lazy days on the beach are your thing, we’ll be delighted to transport you in air-conditioned comfort to one of the local beaches. Traditional markets and beachside restaurants are just some of the local flavours you can take in during your beach trip. Ask a member of our guest services team to explain the options available. 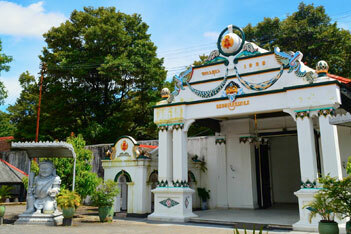 Keen to experience the hustle and bustle of Yogyakarta’s famous main shopping street, Jalan Marlioboro? Or maybe you want to practice your negotiating skills for some local souvenirs? Salivating at the thought of all the tempting, freshly prepared and famously delicious Yogya street food? Make the most of your City tour with the expert help of one of our local driver/guides who’ll help you enjoy your Yogya City experience in every way possible. Riding through the lush, green padi fields that are a dominant feature of Tembi, and taking a leisurely bike ride through some of the most sbeautiful local scenery is a wonderful way to connect with the beauty of Yogyakarta. Modern, single person, tandem and even battery powered electric bikes are available to guests. Just ask any of our friendly and helpful staff to arrange your biking experience. 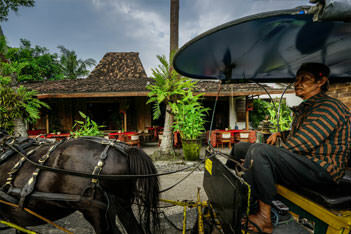 D’Omah Village Resort has a traditional horse and carriage. 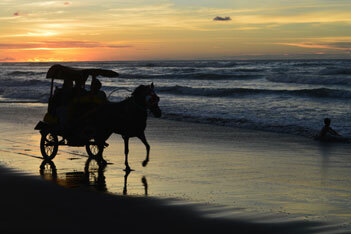 Arrange an enjoyable and memorable ride around our village and through the padi fields. Popular with adults and children of all ages, this is one of the most traditional ways to see Tembi Village and say hello to many of its inhabitants. During a typical one hour excursion, and in order to be kind to the horse, your driver will take a short animal welfare break usually every 20 minutes. Yogyakarta is renowned for the kaleidoscope of amazing dishes, tastes, spices and flavors that traditional Yogya food offers. 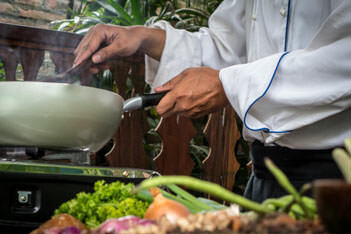 Learn how to shop for, prepare and cook with local ingredients a number of dishes that you can serve up at home as a memento of your Javanese experience. 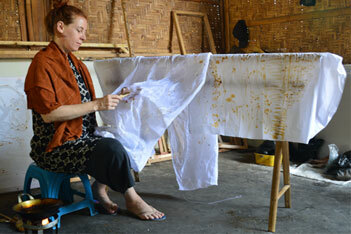 Batik fabric dyeing and printing is one of the oldest and most famous skills of Yogyakarta textile artisans. We have forged strong relations with a select group of Batik producers and workshops who represent the best of Batik in our experience. Visit a traditional Batik dye house and see fabrics being printed with the most intricate patterns and dyes, and maybe treat yourself to a souvenir Batik shawl, scarf, blouse, shirt or range of exquisite Batik table linen. d’ Omah is conveniently located close to a major handicraft center where items of terracotta are also produced. 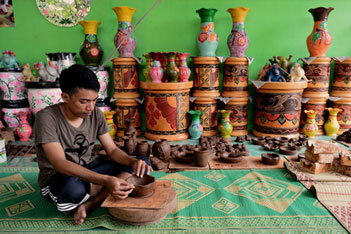 Our front office staff can arrange a visit to this center to include a course in terracotta making as a wonderful souvenir of your visit to Yogyakarta.